D.A.R.E., remember them? D.A.R.E. 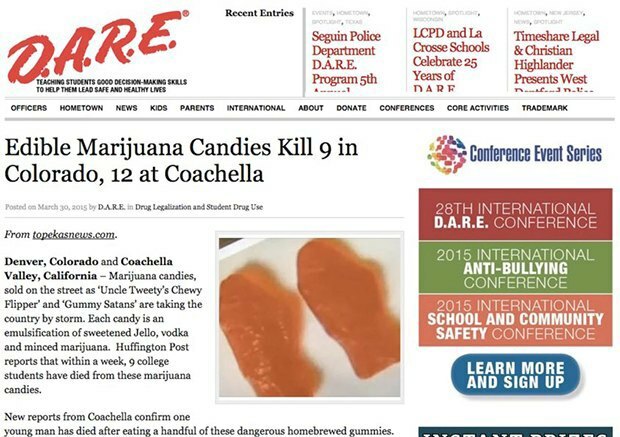 (Drug Abuse Resistance Education, the anti-drug organization from your childhood) posted a laughably hilarious news story (since removed from the organization’s website) about the dangers of edibles. Too bad the folks at D.A.R.E. didn’t check to fact-check their source’s credibility (topekasnews.com is a satricial website fyi), and instead they come off sounding your crazy uncle who thinks articles from The Onion are in fact real. Being taken in by a fake news site isn't exactly novel (all of us have been at one time or another), but posting misinformation and scare-mongering writeups without fully investigating the validity of your claims does tend to undercut the message a bit, especially if you're federally funded organization designed to educate the public on drug abuse prevention.